Students at North Star High School will once again be using Chromebooks to support their learning this year. Returning students will retrieve their returned Chromebook during the first week of the 2018-19 school year and newly enrolled students, including incoming freshman, will receive a Chromebook during Readiness Days on July 31st or August 1. This message contains important updates and information regarding the Parental Acknowledgement (PA), the Student Responsible Use Agreement (RUA) and the Chromebook Assurance Program (CAP). Signatures from the 2017-18 school year will be honored if an RUA is already on file. 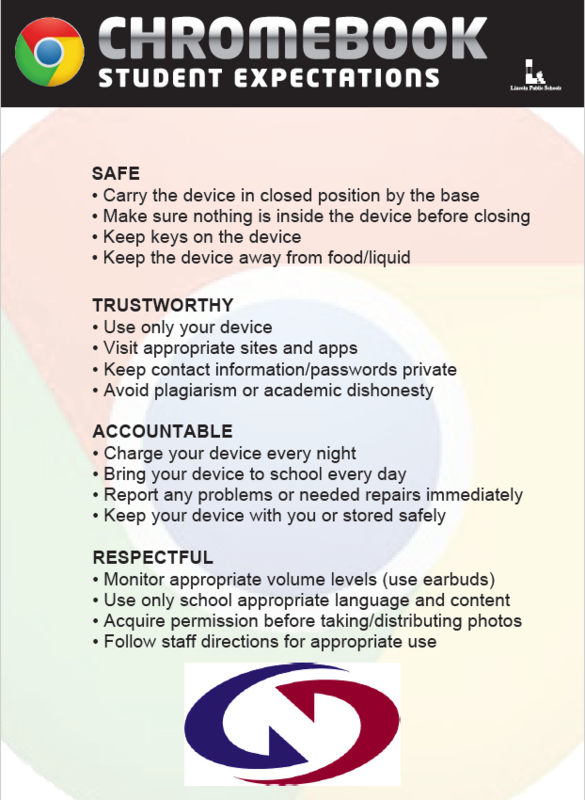 School administration will contact parents/guardians of students who are still in need of a signed PA. Chromebooks will be returned to these students during the first week of school during the regular school day. A PA will be mailed home mid to end of July with their census form. It must be signed by a parent/guardian and returned during School Readiness Days on July 31 or August 1. If misplaced, a copy to print at home can be found here: lps.org/go/OVB5. Additional copies will also be available during Readiness Days. *** 10th-12th grade students who transferred from another LPS high school to North Star, will have their Chromebooks returned to them at North Star during the first two weeks of school. If you choose not to participate in the program, the fee can be ignored (it will eventually be removed automatically). Responsible Use Agreement (RUA) – It is important to mention that the use of a Chromebook is a privilege, and students will be expected to demonstrate a high degree of responsibility with them. As such, students and parents/guardians will be expected to sign a RUA prior to receiving a Chromebook. Student Computing Device Coverage Program Details – To protect students and families from full financial responsibility for device repairs and/or replacement, LPS offers an optional Student Computing Device Coverage Program. The premium for participation in the program is $20.00, annually ($10.00 for students who qualify for Free/Reduced Lunch Program). The participation is optional. You can make payment via SchoolPay online (directions can be found here: (lps.org/go/OWO1) or in person.